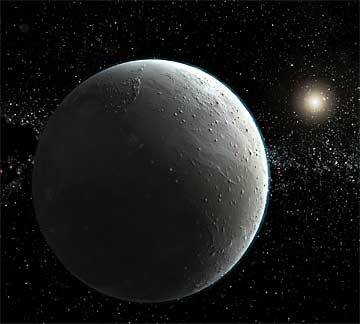 Illustration of possible Earth-size planet beyond Pluto and Kuiper Belt at 100 Astronomical Units (A. U.) from our sun (upper right). Theorized by Kobe University Japanese scientists because of perturbations in the orbits of other bodies in that region of solar system. Illustration courtesy Kobe University, Japan. 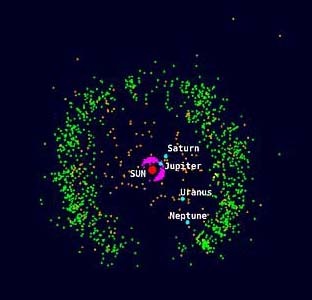 Illustration of Kuiper Belt objects (green) ranging from 42 to 47 Astronomical Units (A. U.) from the sun beyond Pluto. Illustration courtesy Kobe University, Japan.